When a tooth becomes weakened to the point that it can’t safely hold a filling, or if a tooth is cracked, chipped, or fractured, a dental crown can return its strength and appearance. The crown saves the tooth, eliminating the need for extraction and replacement with a dental implant or bridge. As the name suggests, a crown fits over the entire area of the tooth above the gum line, restoring the original size and shape of the tooth, and more importantly, giving it strength. Crowns can be made from a variety of materials, from gold alloy to porcelain. At Ridgeview Family Dental, Dr. Young, Dr. Weststeyn, Dr. Keith place crowns to save the teeth of our patients. And improve the overall appearance of the tooth. While inlays and onlays cover the chewing surface of the tooth and fillings fill in the empty interior space of the tooth, crowns completely cover every visible part of the tooth. 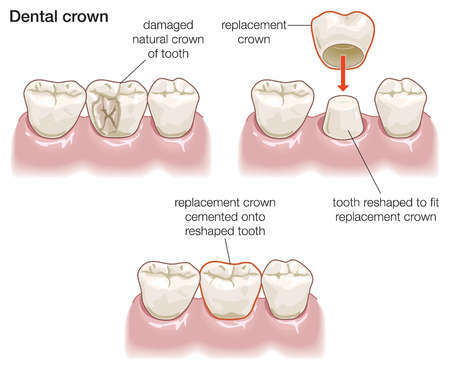 This is why dental crowns are sometimes referred to as “caps.” A part of your tooth remains but is essentially “rebuilt” to resemble the tooth at its exterior best. 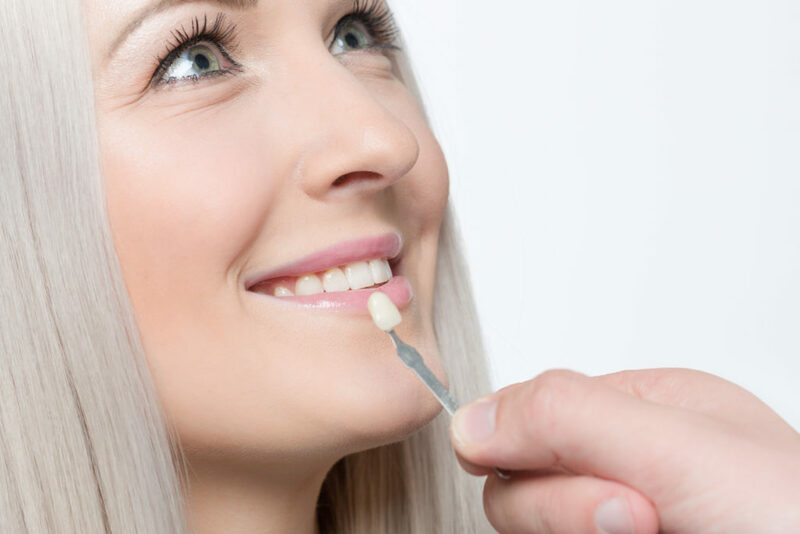 Although porcelain crowns certainly can improve the look of a tooth or multiple teeth, it is recommended only in conjunction with prior repair of the tooth – not simply for cosmetic purposes. What does a crown do for teeth? There are two reasons for crowns. First, they are tooth savers. When the natural tooth either has serious damage, such as a deep crack, it is in danger of needing extraction. If left alone, the damaged tooth will likely break, which will then eliminate the option for crowning it. The same is true if a tooth has a previous filling and then develops new decay. Removing more of the natural tooth will make the tooth very weak. An inlay or onlay could work, but the sure bet is to put a crown on such a tooth. The second use for crowns is to serve as anchors for dental bridges. Bridges are used to fill a gap of one or more missing teeth. Crowns are placed on the healthy teeth on each side of the gap, with artificial teeth (also called crowns but not hollow) attached to gum-colored acrylic resin over metal to replace the missing teeth. The bridge is a single piece and the crowns are cemented permanently onto the healthy teeth. You’ve heard crowns referred to as caps, particularly by older people. This is because most crowns up until about 20 years ago were made from gold alloy. This made them very visible when the person opened his or her mouth. It looked as if your tooth was wearing a gold cap over it. Porcelain — These are used for restoring front teeth because porcelain easily matches the color and translucence of the adjacent teeth. These crowns are completely made of porcelain. They are not as strong as metal or porcelain-fused-to-metal crowns. Porcelain-fused-to-metal — These crowns have an underlying metal structure with porcelain fused to the exterior for appearance. The underlying metal bonds well with the natural tooth beneath. These crowns are stronger than the pure porcelain variety. Gold alloy — These crowns are a mix of gold, copper, and other metals. They are quite visible on the tooth, so many people don’t want to use gold alloy. Golf alloy cannot fracture, though, and it bonds well to the tooth. Base metal alloys — These are made from what are called “non-noble” metals, usually stainless steel. They make for strong crowns, but, again, they are very visible. 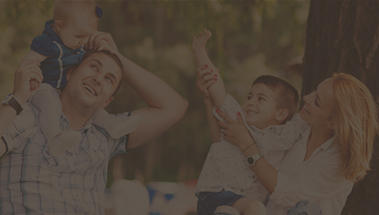 When discussing the need to place a crown, Dr. Young, Dr. Weststeyn, or Dr. Keith will talk with you about your options for the type of crown that would fit your situation. This will involve a mix of considering the strength necessary in the area and your cosmetic preferences (i.e. porcelain versus metal). A crown fits over the natural tooth, completely covering it. The natural tooth has been shaved down on all sides and on the top to make room for the crown. Crowns are single piece prosthetics, and once placed and cemented onto the underlying tooth, they take over the work of that tooth. Crowns are very strong and can withstand the chewing and biting forces that the damaged tooth was increasingly not able to do. When teeth have large amounts of decay or deep cracks, they are in danger of needing extraction. By placing a crown over the weak tooth, the crowned tooth is fully strong again. Depending on the health of the underlying tooth, crowns can last for decades. During your first visit at Ridgeview Family Dental, in preparation for a dental crown, your dentist may take a few X-rays to check the roots of the tooth receiving the crown and surrounding bone. The tooth receiving the crown is filed down along the chewing surface and sides to make room for the crown. The amount of the tooth removed depends on the type of crown used. If, on the other hand, a large area of the tooth is missing (due to decay or damage), your dentist will use filling material to “build up” the tooth to support the crown. After reshaping the tooth, your dentist will make an impression of the tooth to receive the crown. While the crown is getting created, your dentist will make a temporary crown to cover and protect the prepared tooth. Temporary crowns are usually made of acrylic and are held in place using a temporary cement. For your second visit, your dentist will remove the temporary crown and check the fit and color of the permanent crown. If everything is acceptable and the patient is comfortable with the crown, a local anesthetic will be used to numb the tooth and the new crown is permanently cemented in place. Getting a crown is usually not painful at all. Shaving down the natural tooth doesn’t go deep enough to bother the tooth nerves. Of course, removing decay or addressing other damage in the natural tooth needs to be done first before placing a crown on the tooth. That could involve some minor pain. But preparing the tooth for the crown and placing the crown is painless. The life span of a crown depends on the amount of “wear and tear” the crown is exposed to and the overall personal mouth habits (Teeth grinding, nail bitting, etc.) and the oral hygiene of the patient. These are extremely low-risk procedures. Remember, all that is being done is shaving down the natural tooth to make room for the crown, and then placing the crown onto the tooth. Anesthesia is not necessary, so there isn’t risk of a reaction. There are no incisions. This is a safe and effective dental procedure. The longevity of your crown will be determined by the health of the underlying tooth. Take care of that tooth and your crown can last for decades. Otherwise, crowns do not require any special care, just attentive brushing and flossing every day. We would love to discuss your options! Contact our office at 660-747-9117 to schedule a consultation. 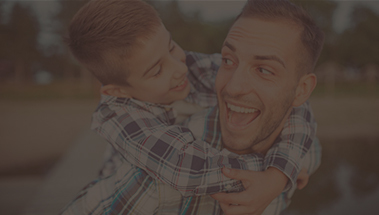 Ridgeview Family Dental serves Warrensburg, Oak Grove, Windsor and surrounding areas. To learn more about Crowns, please contact us at 660.747.9117 today to schedule an appointment.